Bottlefeeding / How often should I sterilize my baby’s bottles? How often should I sterilize my baby’s bottles? Your baby’s rapid growth and development has enabled him to strengthen his immune system by acquiring new defenses along the way. For this reason, the American Academy of Pediatrics and experts mention that it is no longer necessary to sterilize the bottle equipment after each use, as long as proper hygiene is practiced. Wash the equipment thoroughly with hot and soapy water, and let it dry completely. Remember to keep your nails, hands, and kitchen very clean. If hygiene is not accounted for during the preparation of a bottle, sterilizing equipment becomes pointless. Remember that sterilization is necessary if the equipment is new, but after the first use you can wash it normally. Around his fourth month, your baby will begin to take lots of things to his mouth, as a way of exploring them. He’ll be building new immune defenses for his body, so don’t worry too much about it. That’s also why sterilization is no longer a major factor at this point. Hygiene still remains essential, though. 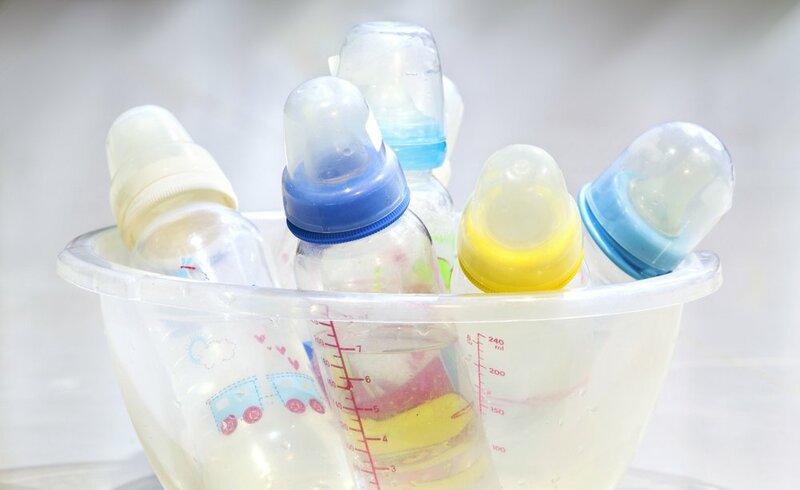 Sterilize your little one’s bottles occasionally to prevent germs breeding on them around milk residue. Follow instructions on the sterilizer (they vary). Make sure your baby’s bottles are safe to steam. Place the bottle upside down in the sterilizer. Cover the sterilizer, turn it on, and leave it until it finishes and it cools down. Most of these sterilizers keep bottles sterile for 6 hours, but remember to check the specific indications on it. You can put the bottles in the microwave or in a microwave steamer. Make sure to separate all parts of the bottle before putting it in the microwave. If you placed the bottles alone in the microwave, it takes 90 seconds to sterilize. If they’re inside the steamer it takes 3-8 minutes. Remember not to introduce anything containing metal in the microwave. Be careful when removing it because it will be very hot. If you keep a lid on the steamer, the bottles will last about 3 hours sterilized. If you did not use a steamer, try to use the bottle right after sterilizing it. Follow the instructions on the label. Usually, you have to prepare a special container with cold water and dissolve the solution there. Insert the bottles to be sterilized in the container for at least 30 minutes. Cover and ensure that everything is under water. Leave the bottles in the solution until you will use them. When you are ready to use it, rinse it with sterile water. You need to change the solution every 24 hours. This method requires great caution to prevent injuries. Before sterilizing, make sure that the bottles can be boiled. Prepare a pot with water and get it to boil. Insert the bottles in the pot, ensuring that there are no air bubbles so they’re all underwater. Cover it and lower the temperature. Leave the equipment at least 10 minutes in the water. Things tend to get damaged faster with this method, remember to constantly check them. It is preferable to take out the bottle just before you are going to use it. If you are not using it immediately, seal the bottles with their lids to prevent contamination.